Composite body, painted, and glazed bottle. Dated sixteenth century. From Iran. New York Metropolitan Museum of Art. A bottle is a container with a neck that is narrower than the body and an opening at the top, called the mouth. It may be made of glass, clay, plastic, or other impervious material. The mouth of the bottle may be sealed externally with a cap or internally with a stopper or cork. A bottle may also be sealed with a metallic disc by the method known as induction sealing. Chinese ding-ware porcelain bottle (far left) with iron-tinted pigment under a transparent colorless glaze, eleventh century, Song Dynasty. Bottles have been developed and used over millennia of human history. They are typically used to store liquids such as water, milk, soft drinks, beer, wine, cooking oil, medicine, shampoo, ink, and chemicals. In a number of countries, glass and plastic bottles are recycled, thereby conserving material resources and reducing the mounting piles of garbage at landfills. Bottle containers have been created since prehistoric times, initially using clay or asphaltum sealed woven containers. Some of the earliest known examples have been found in China, Phoenicia, Rome, and Crete. Early glass bottle manufacture was conducted by the Phoenicians. Specimens of Phoenician translucent and transparent glass bottles have been found in Cyprus and Rhodes. They generally varied in length from three to six inches. These Phoenician examples from the first millennium B.C.E. were thought to have been used for perfume. The Romans learned glass-making from the Phoenicians and produced many extant examples of fine glass bottles, most of which were relatively small. The glass bottle was an important development in the history of wine. When combined with a high-quality stopper such as a cork, it allowed for the long-term aging of wine. Glass has all qualities required for long-term storage. It eventually gave rise to "château bottling," the practice where an estate's wine is put in bottle at the source, rather than by a merchant. Prior to this, wine would be sold by the barrel (and before that, the amphora) and put into bottles only at the merchant's shop, if at all. This left a large and often abused opportunity for fraud and adulteration, as the consumer had to trust the merchant about the contents. It is thought that most wine consumed outside of wine-producing regions had been tampered with in some way. Also, not all merchants were careful enough to avoid oxidation or contamination while bottling, leading to large bottle variation. Particularly in the case of port, certain conscientious merchants' bottling of old ports fetch higher prices even today. To avoid these problems, most fine wine is bottled at the place of production (including all port, since 1974). There are many sizes and shapes of bottles used for wine. Some of the known shapes are characteristic of the place of bottling or type of wine, as noted below. Bordeaux: This bottle is roughly straight sided with a curved "shoulder" that is useful for catching sediment and is also the easiest to stack. Traditionally used in Bordeaux but now worldwide, this is probably the most common type. Burgundy: Traditionally used in Burgundy, this has sides that taper down about two thirds of the height to a short cylindrical section, and does not have a shoulder. Champagne: Traditionally used for Champagne, it is similar to a Burgundy bottle, but with a wider base and heavier due to the pressurization. The Codd-neck bottle was designed for carbonated drinks. In 1872, British soft drink maker Hiram Codd of Camberwell, south east London, designed and patented a bottle designed specifically for carbonated drinks. The Codd-neck bottle, as it was called, was designed and manufactured to enclose a marble and a rubber washer/gasket in the neck. The bottles were filled upside down, and pressure of the gas in the bottle forced the marble against the washer, sealing in the carbonation. 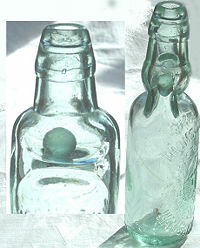 The bottle was pinched into a special shape, as can be seen in the photo to the right, to provide a chamber into which the marble was pushed to open the bottle. This prevented the marble from blocking the neck as the drink was poured. Soon after its introduction, the bottle became extremely popular with the soft drink and brewing industries in mainly Europe, Asia, and Australasia, though some alcohol drinkers disdained the use of the bottle. One etymology of the term codswallop is linked to beer sold in Codd bottles. The bottles were regularly produced for many decades, but gradually declined in usage. Since children smashed the bottles to retrieve the marbles, they are relatively rare and have become collector items, particularly in the UK. The Codd-neck design is still used for the Japanese soft drink Ramune and in the Indian drink called Banta. Plastic bottles (such as the two-liter bottle) used for soft drinks can withstand typical internal carbonation pressures of 2–4 bar (30–60 pounds per square inch), because the plastic is strain oriented in the stretch blow molding manufacturing process. The aluminum beverage bottle, also known as a bottlecan, is made of recyclable aluminum. Beer, soft drinks, alternative beverages and wine have all been packaged in aluminum beverage bottles. CCL Container and Mistic Brands, Inc., part of the Snapple Beverage Group, teamed up, in 2002, for the national launch of Mistic RĒ. The result was a recyclable packaging innovation that utilized aluminum and plastic, leveraging the best properties of each in a practical, attractive and groundbreaking aluminum bottle with a resealable lug cap that fits snugly onto a unique plastic sleeve. The aluminum bottlecan is an ecological alternative to plastic bottles. Shaped similar to the traditional glass beverage bottle, the aluminum beverage bottle is available in a broad range of profiles, styles and configurations for commercial production. CCL Container, North America’s leading producer of impact-extruded aluminum packaging offers a variety of shapes, including “traditional,” “oval,” and “sport.” Resealable lids are also available as a cap option. Some jars and bottles have a metal cap or cover called a capsule. They were historically made of lead, and protected the cork from being gnawed away by rodents or infested with cork weevil. Because of research showing that trace amounts of lead could remain on the lip of the bottle, lead capsules (lead foil bottleneck wrappings) were slowly phased out, and by the 1990s, most capsules were made of aluminum foil or plastic. Currently, glass and plastic bottles are often separated for recycling during garbage collection. 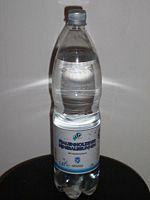 In some places, the consumer is charged a legally mandated deposit for a bottle, and this deposit is refunded when the bottle is returned to the retailer. The recycling process reduces litter, reduces the mounting piles of garbage at landfills, and conserves material resources. ↑ G. Perrot and C. Chipiez, Histoire de l'art (Paris: Hachette et Cie, 1882), 734-744. ↑ George Rawlinson, History of Phoenicia (London: Green Longmans publisher, 1889). ↑ A load of codswallop. The Phrase Finder. Retrieved August 3, 2008. ↑ Lawrence M. Fisher, Lead Levels in Many Wines Exceed U.S. Standards for Water, New York Times. Retrieved August 3, 2008. ↑ Chris Lecos, FDA proposes ban on lead foil wraps for wines, FDA. Retrieved August 3, 2008. Hedges, A.A.C. 2000. Bottles and Bottle Collecting. Princes Risborough: Shire. ISBN 0852632096. Gerth, Ellen C. 2006. Bottles from the Deep: Patent Medicines, Bittlers, & Other Bottles from the Wreck of the Steamship Republic. Las Vegas: Shipwreck Heritage Press. ISBN 1933034076. Kleiner, Robert. 1994. Chinese Snuff Bottles. New York: Oxford University Press. ISBN 0195857569. Polak, Michael. 2005. Warman's Bottles Field Guide. Iola, WI: KP Books. ISBN 978-0873499699. Polak, Michael. 2006. Antique Trader Bottles Identification & Price Guide. Iola, WI: Krause Publications. ISBN 0896892433. Van den Bossche, Willy. 2001. Antique Glass Bottles: Their History and Evolution (1500-1850): A Comprehensive, Illustrated Guide, with a World-Wide Bibliography of Glass Bottles. Woodbridge, Suffolk, UK: Antique Collectors' Club. ISBN 1851493379. This page was last modified on 22 June 2016, at 15:24.